This autumn-blooming perennial should be placed in the ground in springtime after all danger of frost has passed. 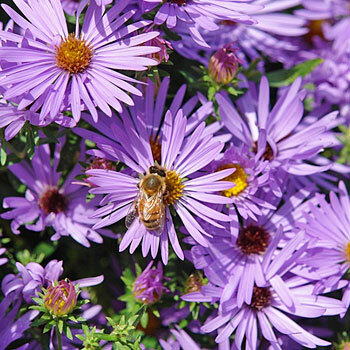 Aster flowers attract birds, butterflies, and bees in autumn, when fewer flowers are available, making it a great selection for sites needing late-season pollinators, as well as a lovely addition to areas that have already flowered. It will grow in most soil types but prefers one that is well-drained and in full sun, or part sun in particularly hot locations. Place the plant so that the crown will remain just above the soil. After planting, top dress with about a half inch of compost; scratch in. Divide every two to three years to maintain vigorous plants, and be sure to share with fellow gardeners to welcome springtime. Watering Details: Water regularly, but do not overwater—they are also somewhat drought tolerant, but extremes will reduce blooms. Diseases & Pests: Asters appeal to the palate of deer and rabbits. Deter these pests by applying an organically-sourced animal repellant, either a spray or pellets. Prevent powdery mildew by placing in full sun with plenty of airflow; apply an organic fungicide every week or two if needed—also remove any infected leaves. Plant: Long, narrow blue-green leaves grow on hairy stems of this bushy mounding plant and smell of mint. Cut back by approximately one third in early summer to promote bushier plants. If the mound appears dead-looking, it is likely time to divide. Flowering: Daisy-like lavender-colored flowers make for an excellent autumnal cut-flower arrangement. In medieval Europe, asters were burned in an effort to scare off serpents.